Walking around Boston Commons on a beautiful day: free. Enjoying a day with friends: free. Walking through the public gardens and capturing this picture: priceless. Funny… Priceless…. free picture… love it!! great take for this week theme, yep he’s on free man..;) Have a great weekend! Cool! You got the great shot! Happy weekend! Thats one way of getting a tan,… lol. 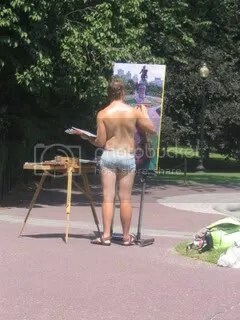 Looks like he does a great job on the painting. Great photo and have a good week. boston commons, huh? LOL!!!!! next time i’m visiting the city, i’ll have to keep my eyes peeled.